For their final projects, our graduating MA Culture, Criticism and Curation students present a publication and a series of exhibitions and events. Working in partnership with international and national organisations, artists, designers and writers, these projects consider activism and representability, identity and the self, gender and work, community and experience. As part of the series, a group of student curators presented Persona at the Institute of Psychoanalysis. Inspired by the work of Sigmund Freud, this exhibition reflected on different concepts of identity and personality. Here, student curators Marco Galvan and Maddy Ciani talk us through the four artworks featured in the exhibition. 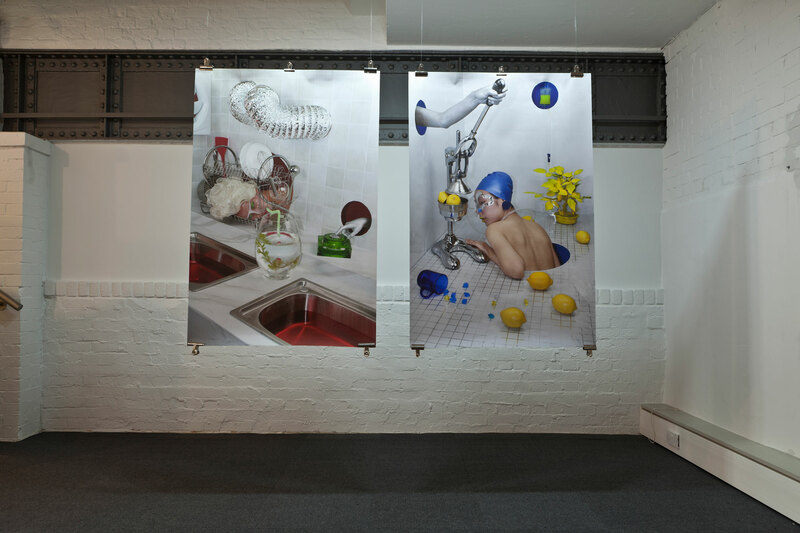 The four artworks featured in Persona relate to the field of psychoanalysis and more specifically, to Sigmund Freud’s theories of identity and personality. Freud argued that human identity is constantly split, shaped by social demands and pushed by natural drives. Freud schematised this split by classifying three different parts of the psyche: ego, id and superego. These distinct but interrelated elements represent the power struggle within our minds. Freud argued that the main aim of the human being is the discovery of their proper identity and the understanding of what makes them unique. The exhibition at the Institute of Psychoanalysis set out to showcase this idea of tension between identity and personality, exploring how art can be a useful resource to address and visualise this theory. 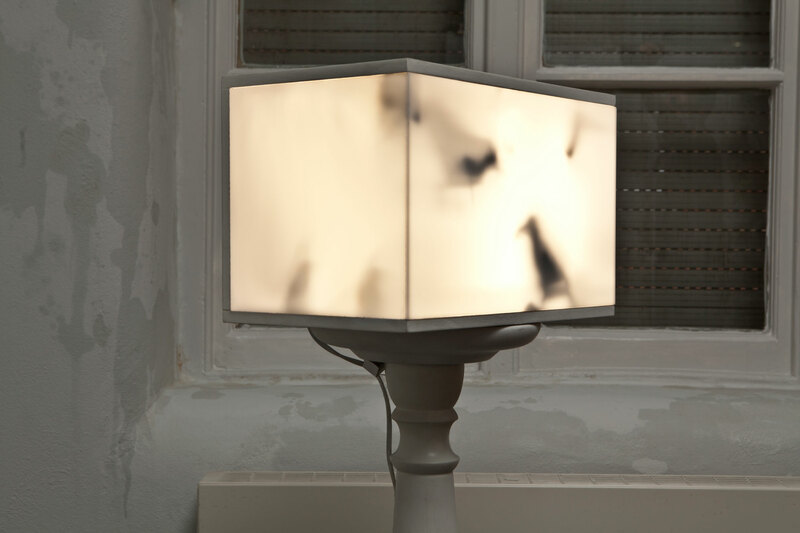 Martina Camani’s They Shines With Both is an installation and a performance which represents the coexistence of the masculine and feminine elements in each of us. 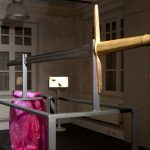 The artwork consists of a steel sword with a golden hilt lying on top of a metal structure alongside a transparent fuchsia organza suit. Through the meeting of horizontal and vertical lines and the use of gold and silver, the sword represents the meeting of masculine and feminine traits. During the performance, the weapon is wielded by a performer who, preparing for the action, wears the fuchsia organza suit and starts fighting alone. The organza suit was designed and produced according to shapes that adapt indifferently to the body of a man or a woman. 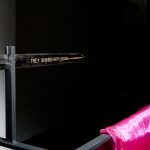 In the title of the work, they, used as a singular pronoun, addresses to all those who do not identify with gender binary pronouns. Jiaqing Mo’s A Drinking Space comprises two utopian and visionary photographs. Mo’s multidisciplinary practice focuses on themes including our relationships to time, endlessness and instability. Mo’s research and output centres unexpected situations and spaces, created to represent her disordered vision of time and space. In A Drinking Space, the intention was to stress the relationship between humans and objects – specifically food. The work explores our habit of ascribing various meanings to objects. Even if inanimate, we give them a soul, we elevate them to the status of symbols, which paradoxically, makes us fall under their control and influence. What happens if we fall into a dangerous, dependent relationship with one of them? As curators, we were interested in the intertwining relationship between these two photographs and the influence that food-objects have on human beings. Melik Ohanian’s Annlee: I’m Dreaming About a Reality forms part of an iconic project which united a network of artists around a single character. 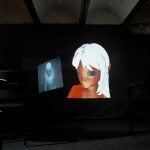 In 1999, artists Pierre Huyghe and Philippe Parreno bought the copyright to a manga character they named Annlee. Over the next three years, they created works in which to develop her identity and invited other artists to contribute to the project. Thanks to her new handlers, Annlee acquired multiple identities. With so many artists animating her, investing in her with various virtual lives and a wardrobe of personalities, Annlee gained quasi-celebrity status, maybe even a kind of immortality. As each personality reveals itself, controlling the character’s behaviour and thoughts, Annlee becomes a symbol used to understand social power, female selfhood and post-human identity. In reference to Freud’s work and within the framework of Persona, the Annlee project reflects on the psychoanalytical theme of the multiple identity, also known as dissociative identity disorder. In the exhibition we were able to show one of the 28 different personalities of Annlee, thanks to the VanAbbe Museum. Persona took place at The Institute of Psychoanalysis from 12–16 November 2018 and coincided with the 100th anniversary of the International Journal of Psychoanalysis. It was curated by MA Culture, Criticism and Curation students Kratika Baderiya, Maddy Ciani, Marco Galvan, Vera Gan, Xueyan (Candace) Ouyang, Carla Ferreira Valois Lobo and Mimi Wong.